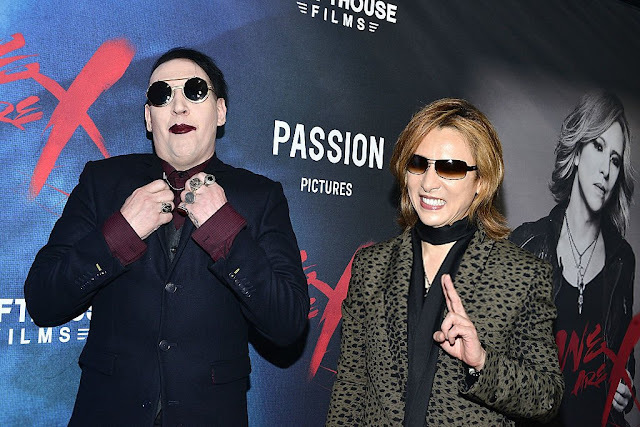 YOSHIKI and Marilyn Manson Have Been Recording a Song | VKH Press – J-Rock & Visual Kei Coverage Worldwide! You read that right! A few weeks ago, YOSHIKI's Youtube channel uploaded a video showing footage from the premiere events around the world for X JAPAN's documentary movie We Are X . The footage from the Los Angeles premiere contains positive reactions to the movie by many celebrities. During his interview, Marilyn Manson mentioned this while talking about YOSHIKI: "We wrote a song together and we're going to finish it together." YOSHIKI has also confirmed this in a past interview, saying: "Marilyn Manson...he lives very near my studio in Los Angeles. Actually, we are working [on] a song together right now. I was in Los Angeles a few weeks ago, so we were recording together. I don't [know] if I should say it yet [laughs]. [You are going to] hear that music pretty soon, I guess."